Miro Model 3-R-2 Rooftop Pipe Supports. Roller-Bearing Pipe Support Fits 3 inch (3.75 Od Pipes. Provides 2-1/8 inch Clearance Height. Case of 24. Price/Case. Miro Model 3-R-2 Rooftope Pipe Supports. Roller-Bearing Pipe Support. Fits 3-inch (3.75 OD) pipes. "Roller-bearing" pipe support used to support roof-mounted gas pipes, electrical conduit, solar piping and other mechanical piping. Unique design absorbs thermal expansion and contraction of pipes thus preventing damage to the roof membrane. Pipes rest on a polycarbonate resin roller and a rod situated in a polycarbonate resin seat. 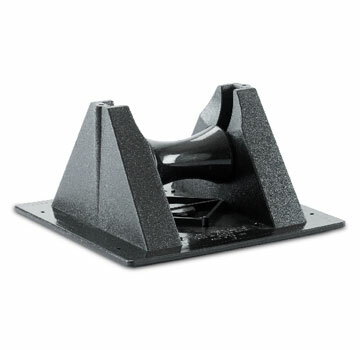 Size: The Pillow Block Pipestand Model 3-R-2 is made in one standard size. The base is 7-3/4" square, the top of the roller device is 2-1/8" high, the top of the cradle is 2-1/8" high, and the maximum width of the interior of the cradle is 3.875". Max. Pipe Size: 3" (3.75" outside diameter). Max. Pipe Clearance: Rod and pipes supported one pipestand high will have a clearance of 2-1/8". Optional 3-R spacers (optional) increase the clearance of the pipe by 2" each. Max. Load Weight: Maximum load weight may not exceed 79 lbs. per pipestand. Spacing: Recommended spacing is not to exceed 10 feet centers depending upon the load. Make certain each pipestand is properly elevated to even the load weight on all pipestands. Other standard sizes available to fit 3 to 6 inch pipes with heights up to 12 inches. Custom configurations also available. OMG SMALL PipeGuard Pipe Suport, Black EPDM, 3-1/2 Inch Standoff, 4 Inches wide. Fits pipe sizes 3/4 to 2 Inch nominal. 650 lb Load Capacity. Price/Each. Miro Model 3-R-4 Rooftop Pipe Support. Roller-Bearing Pipe Support Fits Up To 3 inch (3.75 Od) Pipes. Provides 4 inch Pipe Clearance Under Pipe. Case of 24. Price/Case. GreenLink #2011 Knucklehead Large Pipe Support Kit. Supports one 3-inch pipe. Pipe height is adjustable from 2.5 to 3.5 inches. Base is 7 inches OD. Kit is 12 Knuckleheads plus 2 tubes of Greenlink Adhesive Sealant. Price/Kit. GreenLink #2011 Knucklehead Large-Pipe Support (1). Supports one 3-inch pipe. Pipe height is adjustable from 2.5 to 3.5 inches. Base is 7 inches OD. Greenlink Adhesive Sealant not included. Price/Each. GreenLink #2006 Lite Pipe Knucklehead Pipe / Conduit Support (1). Supports one 1-inch pipe or two 1/2 inch pipes. Pipe height is adjustable from 3.3 to 4.5 inches (top, 2.3-3.5 clearance). No sealant is included. Price/Each. Miro Model 3-R-2 Pipe Strap. Aluminum Pipe Straps Fit Model 3-R-2 Pipe Supports. Includes #8 Stainless Steel Screws. Price/Each.